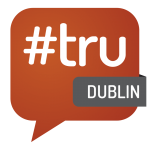 @IrishRecruiter / #tru / Thank you for taking part at #truDublin 2016! A very big THANK YOU to all taking part at #truDublin 2016, making it great! It has been a great day of open conversation about recruitment with over 130 people registered from over 60 companies, participants coming not only from Ireland and Northern Ireland, but also Scotland, England, Netherlands, Croatia and USA. Special thanks to Social Talent, FRS Recruitment, Clinch, HRPRO, Dogpatch Labs, JobsBoard.ie, Accenture and Turas Nua for their sponsorhip, to all Track Leaders and Show & Tell Presenters. Above all THANK YOU to all who took part and contributed to the event, making it “the best TRU so far”.